Welcome to the Arizona Buffalo Slayers! : What Is That Delicious Smell...? What Is That Delicious Smell...? How Much Is $1 Trillion Anyway...? I Wonder If This Idea Will Take Off...? Are you having a BBQ? Someone throw a burger on the grill? 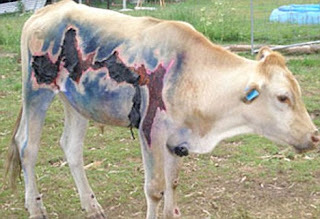 Nope...just a cow getting struck by lightning out in the field! "The poor creature was struck by lightning and left with blistering burns. You would expect it to have been cooked alive. But the cow miraculously survived, apparently unperturbed by the ordeal, and is already back roaming the meadows."